Dividend stocks can be fun. They're also often a heck of a lot easier to hold through the market's turbulence, since you can count on a steady paycheck each quarter. And the higher the yield, the better -- at least so long as it's a dependable payout that investors can count on. To help you dividend hunters get started, we set the bar at 3%, and asked some Motley Fool contributors to identify three stocks that paid at least that yield, and made their cut as a top dividend stock. They came back with Bank of N.T. Butterfield & Son Ltd. (NYSE:NTB), Brookfield Property Partners LP (NASDAQ:BPY), and Ventas, Inc. (NYSE:VTR). Dividend stocks: as close to a money tree as you can get. Image source: Getty Images. Jason Hall (Bank of N.T. Butterfield & Son Ltd.): Only a few weeks ago, Butterfield wouldn't have qualified for this list as its dividend yield has generally been well below 3% for most of the past year. But when a disappointing earnings report sent its stock down by nearly one-fourth on Oct. 24, Butterfield's dividend yield was pushed up to 3.7%. That's a solid yield for any bank stock, but especially attractive for one with Butterfield's prospects. Yes, its third-quarter earnings report showed some concerns. Heck, it's more than just concerns; the full-service banker and wealth manager's net deposits actually shrank in the quarter. That's not the right direction if you're looking for growth. According to management, the loss of a single high net worth client accounted for the majority of the decline, and I'm not one to evaluate any business based on losing a single customer. To the contrary, Butterfield remains one of the best-known names in full-service banking for high net worth individuals, which are a growing segment of the global population. Furthermore, Butterfield's profitability and returns are incredible. NTB Return on Assets (TTM) data by YCharts. Most banks are happy to get 1% and 10% ROA and ROE in the current environment; Butterfield does significantly better. Lastly, it's cheap, trading for 12.8 times earnings. 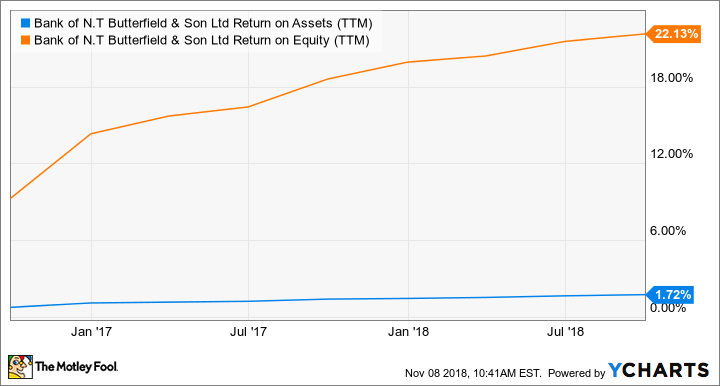 Yes, it trades for over 2.9 times tangible book value, but because of its very high profitability metrics and its business model, its book value should trade for a much higher multiple than other traditional banks. All said, Butterfield is too cheap to ignore. And with that nice 3.7% yield funded by profits from the worlds wealthiest, you can enjoy a little Robin Hood experience every quarter when your dividend check arrives. But without the sheriff knocking on your door. Matt DiLallo (Brookfield Property Partners): Global real estate giant Brookfield Property Partners is a great option for income-seeking investors these days. For starters, it offers a high-yielding dividend that's currently an attractive 6.4%. The company supports that payout with the cash flows generated from a large and diversified real estate portfolio, which includes some of the top office, retail, and multifamily properties in the world. As good as Brookfield Property's income stream is today, though, it should be even better in the coming years given the company's view that it can increase its payout at a 5% to 8% annual pace over at least the next five years. Driving that outlook is the company's belief that it will grow its cash flow by 7% to 9% per year over that time frame, driven by its ability to capture higher rates on existing space as leases expire and its current slate of development and redevelopment projects. However, what makes Brookfield Property even more attractive is that investors can buy its growing income stream for a great price. Currently, units of the partnership sell for around $20 apiece. That's a meaningful discount to the value of its real estate assets, which the company pegs at $29 per unit. Because of that, Brookfield Property Partners offers investors significant upside potential to go with a steadily rising cash distribution, which makes it one of the top options for income seekers to consider buying these days. Matt Frankel, CFP (Ventas): If you're looking for an excellent combination of high dividends and long-tailed growth potential, healthcare real estate investment trust (REIT) Ventas could be worth a closer look. As of this writing, Ventas pays a generous 5.6% dividend yield that's well covered by the income it generates. And the company's growth potential over the next few decades is massive. The majority (56%) of Ventas' portfolio is composed of senior housing properties. Medical offices make up another 19%, and the rest consists of life science facilities, health system properties, and other healthcare real estate investments. Here's where the growth comes in. Healthcare facilities disproportionally serve older people. This is obviously true in senior housing, but it also applies to other types of healthcare properties. For example, seniors go to medical offices more often than younger people and spend more when they go. And, life science facilities develop drugs and treatments, many of which are intended primarily for the older age groups. Over the coming decades, the senior citizen population in the United States is set to explode as the massive baby boomer generation ages. In fact, the 80-and-older age group, which is the target demographic of senior housing, is expected to roughly double over the next 20 years. In a nutshell, there will be a steady rise in demand for healthcare real estate for decades to come, and as one of the leaders in its space, Ventas will be in an excellent position to take advantage.